Incompetence can have its benefits, it can even sometimes lead to adventure – that is my experience. A simple small error or misunderstanding can lead the way to the unexpected: an experience that perhaps you did not plan for but which you are grateful for in hindsight. This is how I came to walk from Jezero to Jajce in central Bosnia, from the Republika Srpska (RS) to the Bosnian Federation. In Jajce I had enquired at the bus station about transport to the nearby Pliva Lakes. I used the Serbian/Bosnian/Croat word for lake, ‘jezero’, and was sold a ticket for a bus that was leaving almost straight away. Getting on the bus, I also checked with the driver – I wanted to go to ‘Jezero’. Sure, no problem. We set off out of town and very soon a large body of water became visible through the trees beneath the road. After a while the lake petered out and we followed a river along a narrow gorge. By this stage it was clear that we had already travelled considerably further than the five kilometres I had been told it would be. I mentioned this to the driver but he just motioned that ‘Jezero’ lay a little further on. A few minutes later, a large sign at the roadside announced in English and Serbian Cyrillic, WELCOME TO THE REPUBLIC OF SRPSKA and then, shortly after, a town sign that simply said JEZERO. Then it dawned on me what had happened – in these parts ‘Jezero’ was not just some generic geographical feature but the name of a small town, although calling a town ‘lake’ when it is not actually next to one seemed odd to me. Stepping down from the bus, a road sign pointing back the way we had just come announced that Jajce was 12 kilometres distant. There was nothing else to but to start walking. Passing a busy café-bar full of men drinking Jelen beer and a Bosnian Serb policeman who eyed me suspiciously I retraced my steps eastwards along the road. At least the road was quiet, with only an occasional lorry or speeding car to break the silence every few minutes or so. Back at the sign that announced the RS border were a handful of roadside stalls selling cut-price CDs and DVDs, and even tape cassettes with unreadable sun-bleached covers. Why the stalls had set up here was a mystery. 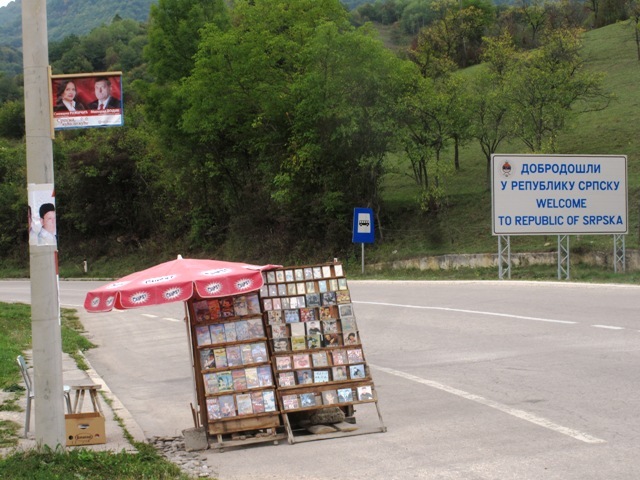 Was it some sort of legal loophole, free-trading in the no man’s land that lay between the RS and the Federation, or does some sort of psychogeographical phenomena exist in which motorists entering the Republika Srpska develop a sudden unexplained hankering for Ceca ’Live in Concert’ and Turbo-folk CDs? 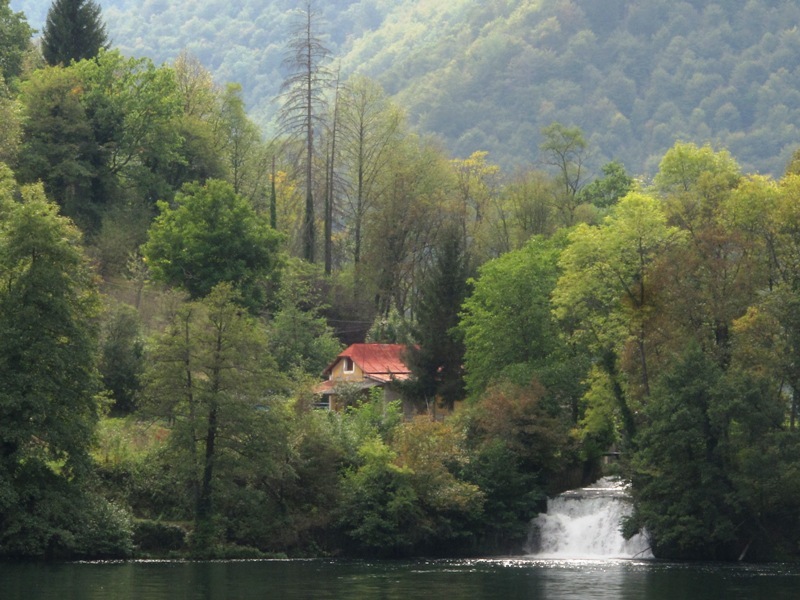 The road back to Jajce followed the river closely, steep wooded slopes rising to a high ridge on the opposite bank. Like much of central Bosnia, it was a landscape of prodigious beauty – lush, green and bursting with bucolic bountifulness – a countryside so gorgeous that the notion of any sort of violent conflict ever taking place against such an exquisite backdrop seemed unlikely, almost impossible. But appearances can be deceptive –this was not only Bosnia but a region that straddled one of the country’s fragile ethno-political fault-lines. An hour’s brisk walk brought me to the edge of the lake close to where a large abandoned glass building rose above trees at the roadside – once a fancy restaurant with a panoramic view perhaps? Now it was unloved with shattered windows and rampant weeds colonising its stairway. From here a track lead away from the road to follow the lake shore and then a series of weirs until the separate channels eventually converged to revert back into a river once more. It was along this stretch that a picture-perfect cluster of small wooden water mills stood, lovingly preserved as quaint rustic heritage. Venturing a little further east, the main road became visible once more high above the river. The track soon passed directly underneath it and little by little the steep-pitched roofs of Jajce started to reveal themselves on the hillside ahead, although, as yet, there was no sign of the town’s fortress or its famous waterfall. Jajce always was Bosnia’s poster girl. 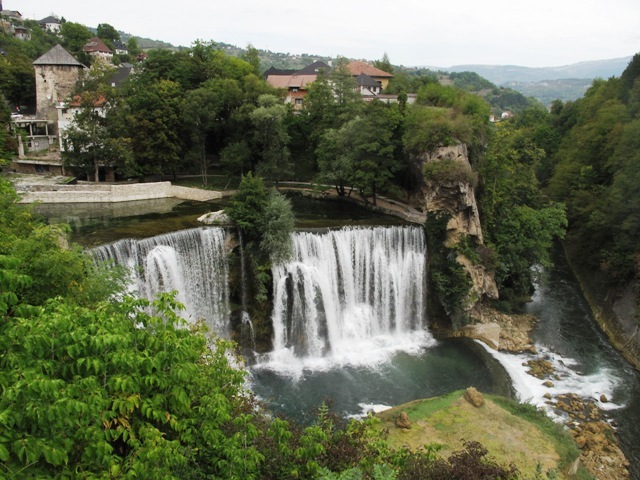 Quite literally: the town’s famous waterfall appears on numerous tourist posters and did so even in the days of package-holiday Yugoslavia back in the 1970s. But this western approach to the town revealed a side of Jajce’s history that does not appear in conventional tourist literature. Walking through the town’s outskirts I passed the ruined shells of houses and long-abandoned orchards, while bullet-scarred walls provied further evidence of recent conflict if ever there was any doubt. This, I suspected, was the part of town where Jajce’s Serb population probably used to reside. These days some of them no doubt live just up the road, across the RS border in Jezero. This is just inference on my part but the reality is what was once a town with a mixed population of Serbs, Muslims and Croats is now overwhelmingly Croat and Muslim. Nearly every town in Bosnia has a similar tale to tell, although the demographic changes vary depending on whoever had the upper hand in a three-sided ‘ethnic cleansing’ war of attrition. Often this was the Serbs but not always. 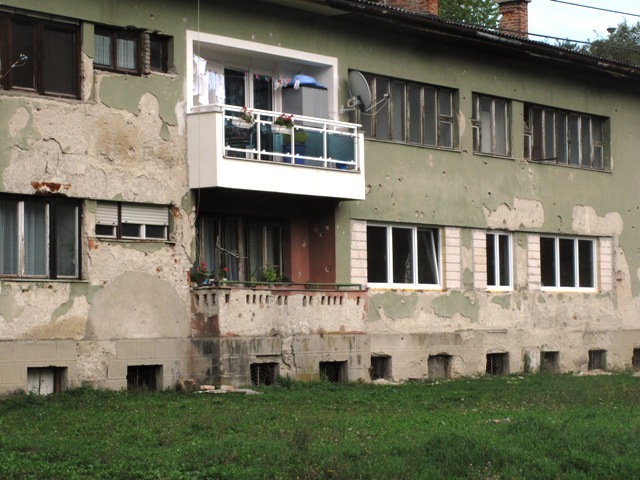 A positive note though: in one battle-scarred apartment block on Jajce’s outskirts someone had clearly recently moved back in, as a brightly painted new balcony complete with satellite dish now stands out defiantly from the bullet-wracked front wall. Bosnia needs its optimists. This entry was posted in Balkans, History, Human Geography and tagged Bosnia and Hercegovina, Jajce, Republika Srpska. Bookmark the permalink. Another fascinating foray into places most of us never reach! The contrasts in places of conflict are astonishing, the sublime in its original meaning perhaps. People do have surprising ways of surviving adversity. 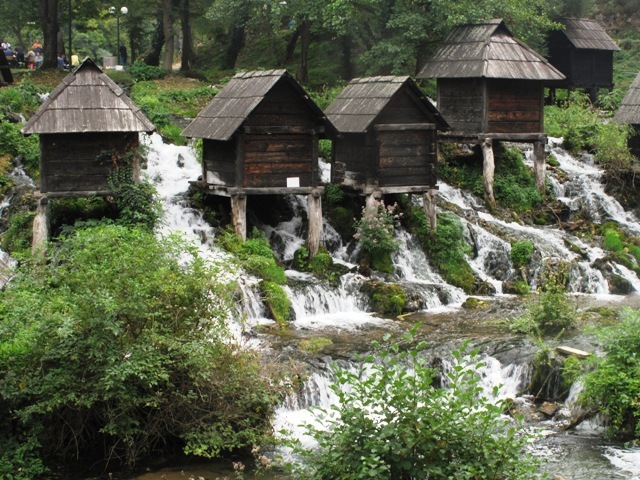 I have never seen water mills like those but they remind me of grain stores in northern Spain and other places. Diana, I think I know the grains stores you mean – like those in Galicia (although they are of stone).These wooden water mills still function apparently although they are quite consciously kept working as part of Bosnia’s very nominal tourist industry. It’s odd isn’t it that conflict has often taken place in the world’s most beautiful places. There again, the most beautiful are often the most poor and marginal places too. Hi Laurence – another wonderful post with stunning visuals! What a thing is serendipity…or even the Tao – it really does show us the way! I do share your fascination with those marginal retail outlets along the way – not much in the way of turnover I shouldn’t think. Fascinating absolutely. Love the watermills, and strange to see so many of them in one place. Love the glass veranda on the decaying house too, also quite strange (I like strange)..
Simon and Bente, thanks to both of you for your kind words.